Late September is a time to explore rivers and streams to witness Canada’s remarkable fish migrations. Pacific salmon (see Salmon Facts link for species information) species such as Coho and Chinook leave their ocean feeding grounds to spawn in BC rivers and estuaries, while on the east coast Atlantic Salmon also return to the freshwater rivers where they were born. 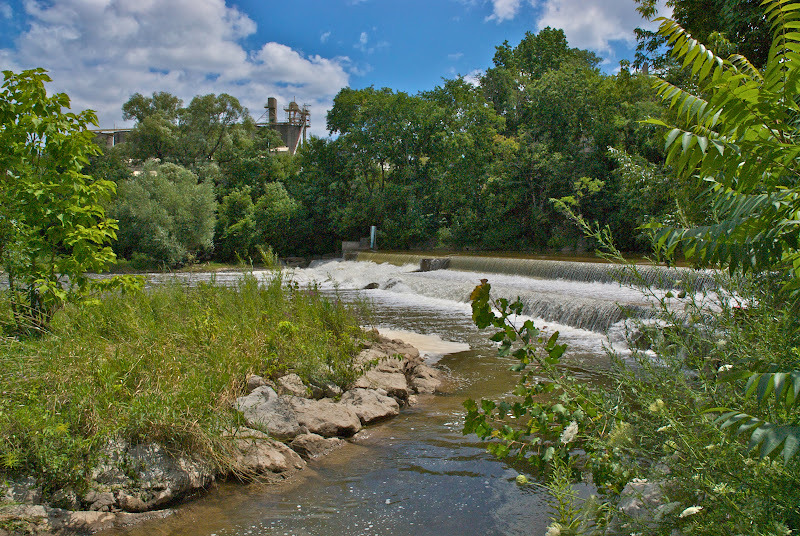 Ontario landlocked salmon move from the Great Lakes into small streams that provide ideal habitat for spawning and the newly hatched alevin. These annual migrations are an essential part of the salmon life cycle and they also provide us with exhilarating nature experiences. 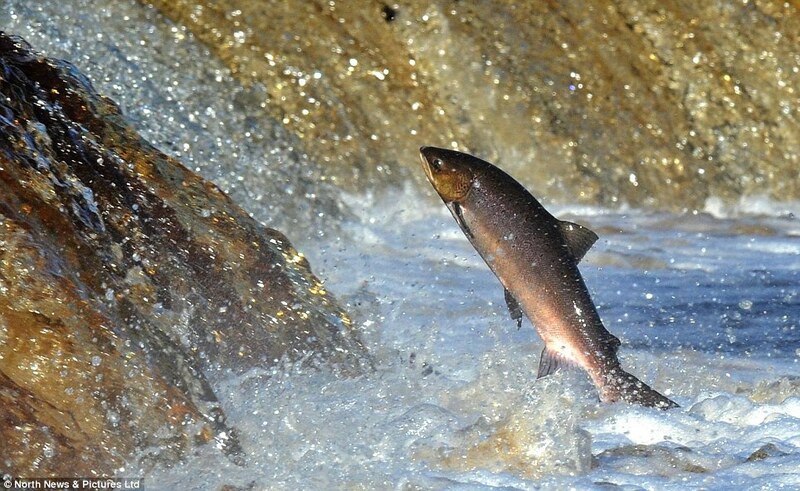 Just imagine sitting next to a stream, watching hundreds of fish swimming against the current and then capturing an amazing photo of a salmon leaping out of the water. While waiting for that perfect ‘Kodak moment’ you could investigate the diversity of life in the stream by carefully turning over rocks along the water’s edge. Look for aquatic macro-invertebrates like the unusual caddis fly that builds its own house out of small pebbles and vegetation. Many of our most familiar insects begin life in the water and provide an extremely valuable food source for young salmon. Several groups including mayflies and damselflies are also very sensitive to pollution and can be used as biological indicators to help scientists monitor water quality to ensure freshwater habitats remain clean. As the salmon move into smaller streams and rivers you are also likely to see large predators such as bald eagles that have come for an easy feast. There is nothing more thrilling than watching one of these birds dive into the water feet first and emerge with a huge fish clutched in their talons. Check it out! Contact a local angling club for good migration observation spots in your area. Threats to Canadian salmon populations include pollution, commercial fishing practices, river barriers, habitat degradation and the impacts from invasive species. In addition to habitat and riparian zone repair, conservation efforts have focused on improving fish numbers. Pacific Coho and Chinook Salmon have been released into the Great Lakes to replace Lake Trout as keystone predators, after trout populations crashed due to overfishing and Sea Lamprey predation. Invasive species are often referred to as “aliens” because they come from far away, but the bizarre appearance of an adult Sea Lamprey makes it really seem like it is from another planet! Belonging to an ancient family of "jawless fishes" that were around before the time of the dinosaurs, adult Sea Lampreys use their round suction mouth ringed with large teeth to attach themselves to other fish and feed on the blood and body fluids of their prey. Sea Lampreys are a native species in the Atlantic Ocean but became invasive when they moved into the Great Lakes and adapted to an entirely freshwater life. Sea Lamprey populations were once so high that they devastated native fish populations in the 1950’s and 60’s causing the collapse of commercial fisheries. The loss of large predatory fish also caused harmful shifts in the predator prey balance of the Great Lakes ecosystem. 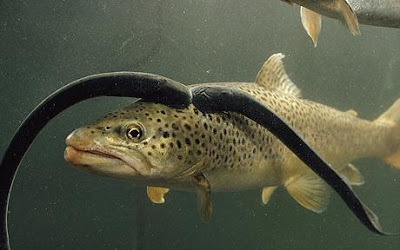 Intensive and costly sea lamprey control measures have successfully reduced populations of this invasive species but it will never disappear completely and Sea Lampreys continue to interfere with fish recovery efforts like the reintroduction of Lake Trout. The Sea Lamprey also poses a threat to other freshwater regions of Canada so we must all take care (scroll down) not to give these aquatic hitchhikers a free ride! There are many things that students can do to help these extraordinary fish by participating in a salmon reintroduction program such as Fish Friends or the Lake Ontario Classroom Hatchery Program. Classes could also partner with a local angling club to plant trees to shade a spawning stream, or work with a municipality on an adopt-a-stream program to clean up a river shore. All of these programs offer valuable outdoor experiences while engaging youth in important environmental work that helps salmon populations throughout Canada. This year, Ontario’s MNR’s Kids’ Fish Art Contest features Channel Catfish and Atlantic Salmon . Learn about and draw one or both of these fish and win cool prizes! The end of the flowering plant season is heralded by Heath Aster, a white-flowered aster with tiny leaves. It is one of our last flowering plants. First frosts will soon end the summer plant season. Found in all provinces, the Canada Goldenrod is one of our latest flowering plants. White-crowned Sparrows and Dark-eyed Juncos have joined the White-throated Sparrows under backyard feeders. The sparrows can be hard to tell apart, as both can have either white or tan crowns. Look for a tuft of yellow above the eye of the White-throated, and a definite white throat patch. Some Juncos may spend all or part of the winter in various parts of Canada. Osprey are departing on migration and will fly over resident populations in the southern U.S. to winter in Central and South America. They are being joined by many other raptors for the flight south. For links to birding in your area check this website. Northern Canada Geese are beginning to migrate to wintering areas usually in V’s or skeins moving south or southeast high in the sky. 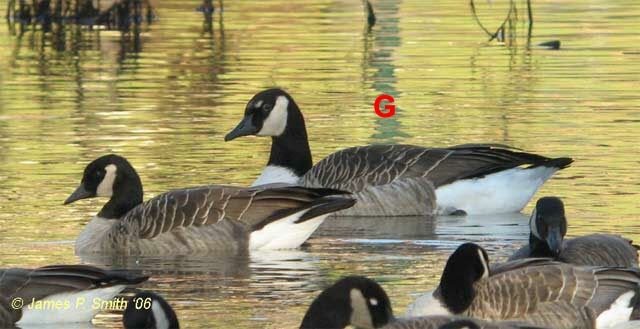 Giant Canada Geese, a subspecies, are flocking and moving around, but will not leave unless there's a local freeze up. Eastern Chipmunks, Eastern Grey Squirrels, Red Squirrels, and Groundhogs are still busy eating, and in the case of the first three, storing, food. Only the Groundhog is a true hibernator, and will stuff its face until fall frosts kill the plants it eats. It will then waddle into its burrow and sleep until March (or February, if you believe the weather guys). A few Spring Peepers and Gray Treefrogs may be calling from wetlands during the day. These are typically first-year males, and they may be responding to similar day/night patterns as in the spring. About a week ago, there was a hatch from one of the Snapping Turtle nests that we had protected. We were lucky enough to see some of them crawl out of the nest, and found 15, which we collected in a bucket and took them down to the lake, saving them a 250 m trip and potential predators. They all took off swimming, with nary a thank you. Woolly Bear caterpillars are on the move, among the last caterpillars (along with Yellow Woolly Bear and American Dagger Moth) to be out and about. They will over winter under bark, rocks or logs. A narrow middle band is supposed to foretell a mild winter. Find some and make a prediction! This part of the month brings the fall equinox, the time when day equals night. This year, it occurs on Saturday, the 22nd. The exact time that the sun appears to cross the equator is 9:54 P.M. EDT. There’s a full Harvest Moon on the 24th, called so because it’s the closest full moon to the fall equinox. The moon will then rise a bit further north each day as the season progresses.